I tell Minnie that the Spanish Influenza has broken out at Camp Funston and describe the preventive measures being taken. I also tell her I passed my “overseas exam.” I wrote a letter to my mother on this same day but won't include it here because it contains much the same information. The only difference is I ask my mother to send some old flour sacks for me to use as laundry bags, and I ask my brother Willis if he has the winter wheat planted yet. Well I am still existing in this old hole. We have not been transferred because an epidemic called Spanish Influenza has broken out in camp. The Lieutenant said that he understood that no big transfers would take place for some time. The [Camp] Funston hospitals are nearly filled with cases. You need not worry about my contracting the disease because I am in the best of health and as soon as any cases are found, they are isolated. This afternoon they marched every one of us down to the infirmary & sprayed our throats & gave us some medicine. Also, the strictest orders are out concerning the disposition of garbage, waste, etc. The worst part of it will be if we are quarantined, I could not get a pass, and I have been counting on one so much. I am afraid we will be forced to remain here for some time. I shure hate that – especially if it keeps raining because it is hard to keep dry in these old tents. I am going to take as good care of myself as I can so you needn’t worry a bit about my getting sick. But if you shouldn’t hear from me for awhile, it will be because I am under quarantine. Keep writing just the same and to the same address. We have lost our “Y” accommodations now because they have torn down the old tent & are building a frame building. Candles are shy also so we have to improve what light we have. Kid, don’t you go to speaking off about my being so much better than you will be when I am discharged. There is absolutely no excuse for it. If a person wants to feel little & no account, he just wants to get into the army. They gave us the overseas examination Tuesday & I passed without a bit of trouble as most of the men did, but some unlucky ones were marked as “B” men and will not be sent across. It rained yesterday just before supper but we stood in line for mess just the same. We were shure glad of our raincoats. After supper, we had to line up to sign the payroll & it was away after dark before we were done. It is hard to tell when we will get our money tho. We drill hard every morning until noon & almost every day after noon. We march to the parade ground either to watch or to parade. We are having the new French platoon drill now used in combat. It is very interesting but makes you work. We haven’t carried rocks for four or five days. Isn’t that fine. Well I must hurry & get ready for bed & put out the light or I will shure get into it. 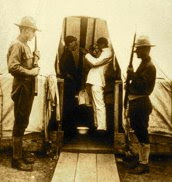 Good night & sweet dreams, --- W. C. G.
A soldier in a Texas Camp gets his throat sprayed during the Spanish Flu Epidemic. In the fall of 1918, the Great War in Europe was winding down and peace was on the horizon. The Americans had joined in the fight, bringing the Allies closer to victory against the Germans. Deep within the trenches these men lived through some of the most brutal conditions of life, which it seemed could not be any worse. Then, in pockets across the globe, something erupted that seemed as benign as the common cold. The influenza of that season, known as Spanish Influenza, was far more than a cold, however. In the two years that this scourge ravaged the earth, a fifth of the world's population was infected. The “flu” was most deadly for people ages 20 to 40. This pattern of morbidity was unusual for influenza which is usually a killer of the elderly and young children. It infected 28% of all Americans. An estimated 675,000 Americans died of influenza during the pandemic, ten times as many as in the world war. Of the U.S. soldiers who died in Europe, half of them fell to the influenza virus and not to the enemy. An estimated 43,000 servicemen mobilized for WWI died of influenza. 1918 would go down as an unforgettable year of suffering and death and yet of peace. The French Platoon Exercise is the combat loading and firing sequence which is geared for speed, and allows for positive control of the firing line with a minimum of prompts from commanders. The object is to have a controlled rate of fire in order to meet tactical requirements and monitor the expenditure of ammunition. The command prompts will ensure that the firing line completes major movements of the weapons at the same time. The object in volley firing is not to have everyone load and fire as quickly as they can, but in a group. Minnie tells me she closed her school early one day because she was sick. She also shares more school stories and tells me she plans to give exams to the school children during the next two days. Well I wonder where you are tonight. You must be out of the Detention Camp by now. I noticed in tonight’s paper that several boys from the 164th D. B. had been visiting Manhattan. I suppose they are from your bunch but in a different Company. I hope you will be in Manhattan before very long. I have certainly had a day of it today – seemed a year long. I got so sick in school this morning but I thought I could tough it out, but after dinner I couldn’t stand it any longer so I told the children if they would just as leave, we wouldn’t have any recess and hurry through all the subjects. They said they would so we had all the recitations and then I dismissed school about a quarter of three. One of the girls, Zelphia, helped me sweep and then I came home and went to bed. I feel better this evening tho. I got up awhile ago and drank a cup of tea. That’s all the supper I get. I’m sure glad I didn’t get awful sick like I do at home sometimes. Mrs. Parkerson is so good. She would do anything for me but she isn’t very well today. Yesterday afternoon the 3rd grade tore up three [news]papers into fine pieces and I put them on the stove and boiled them about four hours. We wanted it to form a paste for making maps. It didn’t seem to work very well yet so I guess I’ll cook it some more. It’s supposed to be fine, but the children said the teacher last year failed to make it work right. I’m going to give exams to about half the classes tomorrow and the rest on Friday. I want something definite to go by in grading them. I hate to make out the grades for the first time. I’m so afraid I won’t give the children the grades they should have. Some of them are not doing passing work in some subjects and I sure hate to mark them so low, but I guess I’ll half to. It seems like to me these children cry easier than any children I’ve ever seen. Two of my older boys cried today about the smallest things. One of them dropped his pencil on the floor and the boy behind him picked it up. I asked him why he wasn’t at work and he said Ora had his pencil. Then he just began to cry like something awful was the matter. Then I helped one of the boys with a problem and at least fifteen or twenty minutes afterward he held up his hand again and wanted me to help him with the very next problem. I asked him if he hadn’t worked any problems all that time. He said, “No” but that he had been trying. Then he began to cry. Well it seemed to me everybody had got up on the wrong side of the bed. I expect I don’t have the patience I ought to sometimes but this boy is so “dum.” He’s in 5th grade arithmetic [while] everything else [is at the] 7th grade level. And do you know that boy can’t add and subtract correctly? I’m just at sea sometimes to know what to do. He may get one problem out of a hundred right, not any more. Our mail will come a little better now [that] the regular carrier comes [and] he waits for the freight. Well, I’m tired and sleepy and that bed looks too inviting so I guess I’ll half to finish this in the morning. I wish you had a nice soft white bed to crawl into tonight. I’ll bet it would feel good to you. Clock struck 10:30. – Good night. Zelphia M. Klein was the 8 year-old daughter of 31 year-old farmer Ross M. Klein and his 32 year-old wife Jadie who lived in northern Grant Township, Riley County, Kansas. Minnie and her students were trying to make paper mache maps from newspaper pulp. Ten year-old Ora Condry, Jr. lived with his grandmother, Mary E. Condry, on Mill Creek Road in Grant Township, Riley County, Kansas. Minnie tells me about more school activities including concerns that someone may be stealing the coal to their stove. I had a letter from you yesterday and another today. But I wish it didn’t take the mail so long to get here. I got the letter you wrote last Friday today. My, but I liked that letter and was sure glad to get it. Don’t you know dear boy that I will always have time to do anything for you? I’m sure glad you suggested something I can do – because I’m sure anxious to do something for you. I won’t make it for a couple of days yet. Then maybe I will know your new address if you have been transferred. I wish I could have known and taken it to you Sunday. I just love to make candy and do things that way and then it gives me something to do up here [that is] different and I won’t get so lonesome. Parkerson’s are still in the evening [so] that when I sit here [in my room upstairs], sometimes it seems like there isn’t anyone for a hundred miles around. You know it’s so noisy at home. I lost the set out of my ring today, or rather it came out but I didn’t lose it. I’m glad of that. But it seems funny not to have it. I’ve had that ring for nine years and have worn it nearly all the time. Ward, you were right. That monthly report is a report I send in to [the] County Superintendent giving the attendance, absences, tardies, etc. I was looking thru my supplies this morning and I found the little blank [form] that I have to fill out. Philip Chalmers came up to me today and wanted to know if I had been keeping the woodshed locked. I told him I had not and he said his father said I had better put the padlocks on every night. One year the coal disappeared faster than they used it at school. So I have to put those two old rusty padlocks on every night. They are awfully hard to work. I don’t mind it now but when it gets real cold, I won’t enjoy standing out there working with those locks. I guess I’ll try oiling them up a little. Miss Carey didn’t get to come up with me Sunday night. We had to come up in the Ford – the Hudson hasn’t been fixed yet, so she couldn’t come. I don’t know when she will come now if I don’t go home Sunday – and I don’t intend to do that. I sent three letters this morning and I must send this and one to Mama tomorrow morning. Then I will only have one cent left to my name. I think it might have been well if I had of used my brains a little Saturday when I was at home and thought ahead a little. I expect I’ll have to borrow from Mrs. Parkerson until Mama can send me some stamps. I hate to do that but I would hate a whole lot worse to disappoint you. If it’s so you can’t write to me boy, I’ll not think you’ve forgotten me. I’ll never think that. I’m glad I know you, Ward, as well as I do. I know you care and will do the best you can. Ward, I’ve been glad all the time that you are in the army, not that I would have anything happen to you for the world, and I don’t believe there will. But it takes a brave boy to do what you’ve done – given up your good times home and so much [more]. Homer and Eve aren’t in because they don’t want to give up a good time, so [your brother] Willis says. And I believe it. How much more I think of you than I do those boys. Ten boys like they are not worth as much as one like you, boy. You are sure standing the hard knocks now, but I bet you’ll be a whole lot happier some day than they ever can be. I’ve always had the most confidence in you, boy. I was scared to death when you went and yet I was glad too, and I thought if you went, you knew what was best. But my, I’m anxious for the day to come when you will be home again. It will seem a long time Boy to me. You’ll be so be much better than me tho Ward. You can’t help but be when you’ve gone thru what you will half to. I’ll feel pretty small. Well I wonder where you are tonight. For all I know you may be on your way to a camp a long ways from here. I hope tho last Sunday wasn’t the last time I’ll see you until you get back for good. But I guess the last time’s got to come sometime and maybe it would be just as well for us not to know it at the time. It’s hard enough to say “goodbye” anyway, isn’t it? We use to think it was awful to say “goodbye” when we knew we would see one another the next Sunday evening. It seems kinda funny now. But I bet I would be as bad again now if you were home. P. S. Wouldn’t it be grand if we should have the good luck to get to spend Sunday home together? I’m almost afraid to hope but I do anyway. Sometimes I just forget and get to planning on it. I’ve thought we would for so long. Philip A. Chalmers was the ten year-old son of 46 year-old Will Chalmers and his 34 year-old wife, Leila whose farm was located in northern Grant Township, Riley County, Kansas.